How did 2nd century Romans decide where to build Hadrian's wall? How did 2nd century Romans decide where to build Hadrian's wall? It is located exactly at the narrowest east-west section of the island. They had no laser theodolites, lenses, aerial observation methods, or map stores. Amazingly enough, they built a second more northerly wall at another narrows, so coincidence has to be ruled out. The Romans were good surveyors. Vitruvius described surveying tools and methods in a book that was still used in the Middle Ages, hundreds of years after it was written. By laying out stakes at fixed distances and using a plumb with simple sighting rods, it is very easy to lay out squares, lines, triangles, etc., and to measure the distances between different points. The Romans divided huge tracts of land into very precise squares and in many places in Italy and France, those plots of land still exist and are used as property boundaries today. 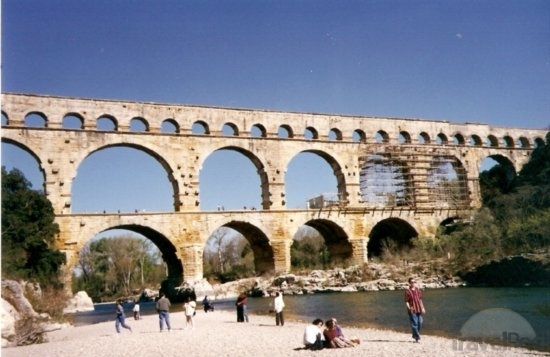 The technology to determine the narrowest point in northern England is as nothing compared to that necessary for supplying Roman towns with running water and baths, as with the Nimes Aqueduct in Southern France, shown here at the Pont du Gard crossing of Gardon River. The Fontaine d'Eure, at 76 m (249 ft) above sea level, is only 17 m (56 ft) higher than the repartition basin in Nîmes, but this provided a sufficient gradient to sustain a steady flow of water to the 50,000 inhabitants of the Roman city. The aqueduct's average gradient is only 1 in 3,000. It varies widely along its course, but is as little as 1 in 20,000 in some sections. Those sections where the gradient is only 1:20,000, or 1m in 20km, are deliberate not accidental, designed to allow the Pont du Gard section to be considerably lower, and easier to build, than would have been required by an even gradient. Further note that while the isthmus of Hadrian's Wall is only 118km long, contemporaneously Roman Engineers were undertaking the building of a 170km tunnel aqueduct, the Gadra Aqueduct, to supply the city of Gadra in Jordan with water. In summary, the Romans were excellent engineers and knew well how to design and survey large tracts and structures. It is faulty reasoning to assume that the absence of modern technology made such feats impossible. It is evident from his description that the dioptra differs from the modern theodolite in only two important respects. It lacks the added convenience of two inventions not available to Hero - the compass and the telescope. It's worth noting that a drop of 1:20,000 equates to only 50 cm over 10 km. In that same 10 km stretch the earth curves by about 10m, or 20 times as much. One can only engineer such a slight grade with a very accurate value for the Earth's radius - and they performed all those calculations in Roman numerals! Measuring, surveying, and map making are ancient practices by the Greeks, Romans, Egyptians, Druids, Chinese... pretty much everyone knew how to trace and measure lines and angles over a long distance. Surveying is based on geometry, in particular triangles, and that was all well known at the time. By the time Hadrian's Wall was begun (122 AD), Euclid's Elements and Apollonius's Conics had been around for centuries, and Ptolemy was working out how large the Earth was and the distance to the Moon. The basic tools are things like sticks, string, chains and weights. Distances can be measured by driving a stick of known height into the ground, and then measuring its apparent height from some distance away. If you can see two known points, you can use triangulation to measure where you are. Straight lines can be achieved by making sure several sticks line up, known as "range poles". Leveling can be done with a plumb bob (a weight on a string). For longer distances where accuracy wasn't important, the Romans even had a basic odometer that could be wheeled along. You may be interested in the book Roman Surveying by Isaac Moreno Gallo which covers the technology, instruments and techniques in detail. Hadrian's Wall runs along the top of the Whin Sill, a geological feature that presents people approaching from the north with a sheer cliff. So the Wall's height was boosted in many places by a natural feature. The Roman's didn't just take advantage of the relative narrowness of the island there -- they used the geography to make the Wall more defensible. The Romans knew where to build Hadrian's Wall because they knew where they needed or wanted to have a wall. Nobody knows exactly why Hadrian's Wall was built. But the Romans ruled the lands of the Brigantes and other tribes to the south, and it is not known how much control they had over the tribes to the north of the Wall. In any case the Wall made it easy to control who traveled north and south, and for what reasons, in that area, which may or may not have been the imperial border at the time. If you go with the most simple theory, that the Wall marked the border of direct imperial control at that time, then if the Romans wanted to build a wall at the border they either had to build the wall where the border was, or conquer land to the north, or give up control of land to the south. So you could say that the Romans built the wall where it was because that was where they wanted to have a frontier at that time. As for knowing where the narrow parts of the Island of Great Britain were, the Romans already had various surveys done in their province of Britain to lay out various Roman roads, and had a good idea of how wide Britain was at various latitudes within the province. To find out how wide Britain was to the north of the Province of Britain, the Romans could maybe ASK people who came from north of the border to trade, perhaps PAYING traders from the north for information. The Roman armies had also marched deep into Scotland, far to the north of Hadrian's Wall, or even the Antonine Wall, long before Hadrian's Wall was built, and left remains of forts far to the north of the two later walls, so the Romans had probably had done a lot of surveying of the parts of Scotland they marched through and built forts in. After the Battle of Mons Graupius in 84 AD Governor Agricola ordered his fleet to sail around Scotland to prove that Britain was an island and to receive the submission of the Orkney Islands. No doubt the fleet would have made maps of their journey and noted the latitudes of peninsulas and bays that affected the width of Britain. Not the answer you're looking for? Browse other questions tagged roman-empire technology maps or ask your own question. How many stones high are the pyramids of Giza? Where did the money come from to build the Colosseum? How did the Romans build straight roads that stretched very long distances? Did it make sense for the Roman Empire to build a great wall? How did Romans organise their files? Where was Canterbury College (Oxford) located?